When was your last ‘wow’ moment? Not the kind when you spot a sweet deal on Amazon, but the true jaw-dropping kind. The kind that stirs a deep sense of wonder and awe inside of you — etching a permanent place in your soul. If you’re like us, explorers at heart, these are the moments we live for. It’s why we travel. And it’s why Italy first called to us years ago. When it comes to Italy vacation ideas there’s no shortage of breathtaking places and sights to consider. But allow us to show you a side of Italy you may not know. A side that continues to draw more “wows” from our breath than any other part of the country. In this post, we share a handful of the countless reasons why we think South Tyrol belongs at the top of your trip wish list. So come see for yourself. South Tyrol just may become your next travel obsession. Before we touch on the sights, adventures and experiences waiting for you in South Tyrol, you may be wondering where exactly is this fabled land. South Tyrol — also called Südtirol or Alto Adige — crowns the far northern edge of Italy enviably located in one of the few places in the world where Alpine wonders thunder into serene Mediterranean beauty. It’s a region of astounding contrasts. A mountainous jewel alive with medieval castles, storybook villages, pristine lakes and miles upon miles of adventure by foot, bike or ski. If you ever wondered how to enjoy both a German and Italian experience on a single European trip, South Tyrol is the answer. Here, traditional Austrian charm dances with classic Italian flair and soaring snow-kissed mountains crash into sun-soaked valleys punctuated with palm trees, orchards and vineyards for as far as the eye can see. South Tyrol, often called “the sunny side of the Alps”, crowns northern Italy right below Austria. The outcome is striking. A collision of cultures, climates and landscapes unlike anywhere else. For centuries South Tyrol fell under Austrian rule. But after World War I, the region changed hands so to speak when it was annexed by Italy — yielding a gift to travelers. A delicious blend of German, Ladin and Italian culture now greets you throughout. If you ever wondered how to enjoy both a German and Italian experience on a single European trip, South Tyrol is the answer. Whether you crave exhilarating outdoor excursions, wish to unwind in pure poolside bliss or long to embark on a culture-filled adventure, South Tyrol lays it all at your feet. After one visit, you’ll understand why we consider the region Italy’s best-kept secret. The only proper way to introduce South Tyrol is to begin with its most lofty characteristic. So captivating are its mountains in all seasons, that it is hard to say when they inspire most. They weave influence throughout the land lancing the sky with their silvery summits and stone-tipped spears. Some seem to caress the heavens while others look as if they wish to tear it asunder. Beautified by arbored vineyards, crenelated castles, storied steeples and romantic ruins, the various mountain ranges of South Tyrol paint the land in remarkably diverse ways. While all of its peaks technically belong to the Italian Alps, two people could visit South Tyrol and leave with completely different experiences. An encounter with the iconic Odle peaks in the Dolomites. 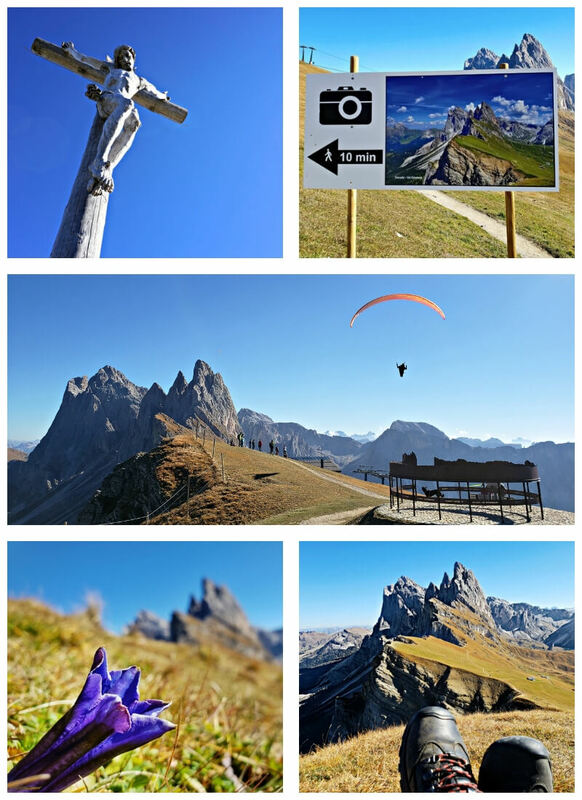 South Tyrol soars with 350 mountain summits at nearly 10,000 feet high. 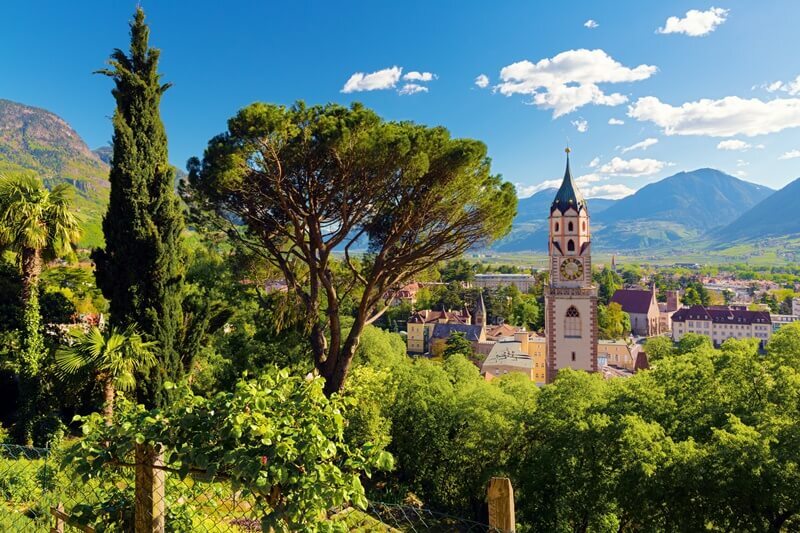 The mountain ranges around the Merano valley, for example, flourish with lush Mediterranean vegetation that gradually unfurls into classic Alpine as you ascend the slopes. With 300 days of sunshine each year, these mountains practically soar with a permanent sunny disposition. The Dolomites, on the other hand, redefine Alpine. Entirely. A UNESCO World Heritage Site, the Dolomites appear born out of some prehistoric fury — tectonic ravages forever suspended in time. In reality, its jarring, serrated crags were once a coral reef millions of years ago before being cast out of the sea. 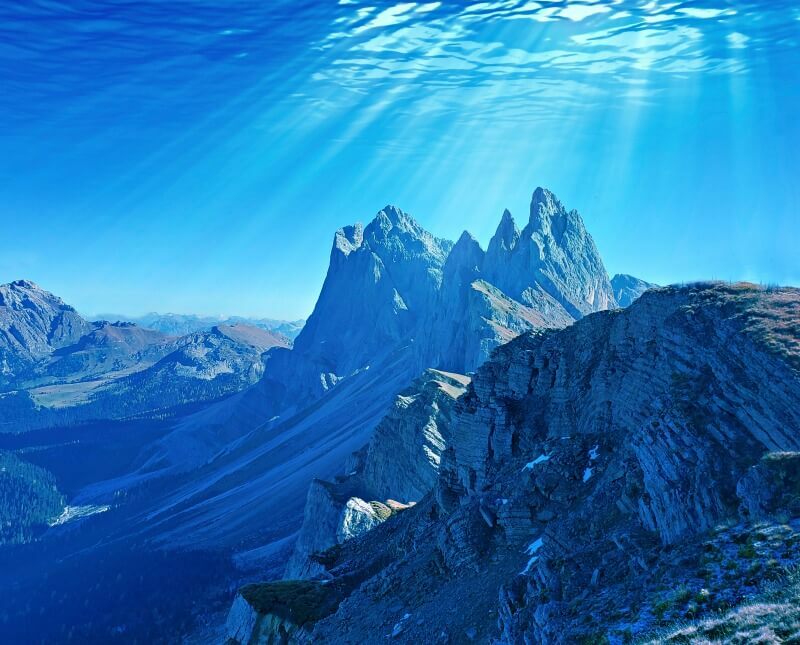 Now, the Dolomites comprise 18 peaks spread across 350,000 heavenly acres. 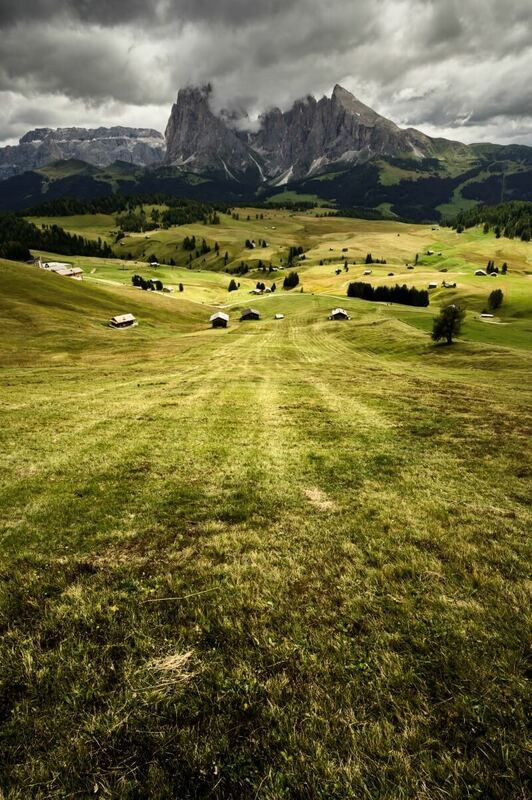 Europe’s largest Alpine pasture, Alpe di Siusi, is a top hiking destination in South Tyrol. In South Tyrol’s Val Venosta, you can experience the striking Alpine world of the Ortles Alps in the Stelvio National Park. With more than 155 miles of trails, this park invites you to roam by foot or mountain bike in diverse landscapes that include nearly 100 glaciers and the highest mountain in South Tyrol — King Ortles. According to age-old legends, this mountain was once a giant that became stone. To the northeast of the Ortles Alps lies another majestic mountain range containing one of mankind’s most historic discoveries. The Ötztal Alps is where two hikers in 1991 found a man lost in ice for 5,300 years. The naturally mummified body of Ötzi the Iceman has shed immense insight into life during the Copper Age. His body and astonishingly well-preserved belongings can now be enjoyed by all at the South Tyrol Museum of Archeology in Bolzano. What do these opposing mountain ranges mean for you as a traveler to South Tyrol? The medley of Alpine and Mediterranean landscapes creates a wild-hearted playground and wellness oasis unrivaled by any other destination. The mountains around Merano wrap you in lush Mediterranean greenery made to mend all worries. 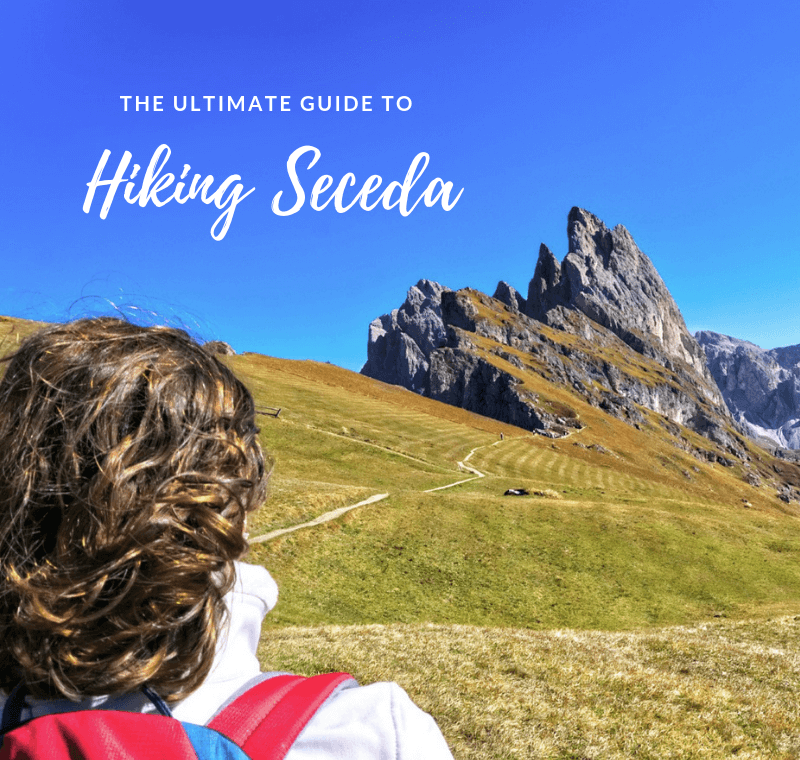 On any given day you can breezily roam through vast prairies and forests, trek skyward to stare at the stoic faces of jutting stone giants, become mesmerized by the illuminating waters of an Alpine lake or smile wildly while hiking under palm-drenched promenades that meld into mountain-born vineyards. Or you can do nothing at all. And simply let the breathtaking scenery massage your mind. South Tyrol welcomes the wandering spirit with wide open arms. Every turn here reveals your next adrenaline rush or moment of zen. With 8,000 miles of trails calling you, deciding how to spend your time will be your biggest challenge. Ten precious Alpine lakes are nestled between South Tyrol’s mountain peaks. 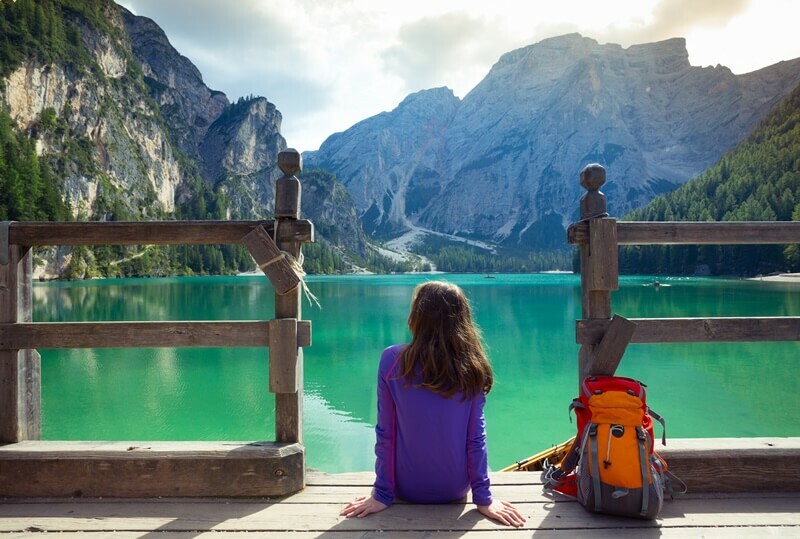 Lake Braies, pictured here, is among the most celebrated crystal clear bodies of water in the world. 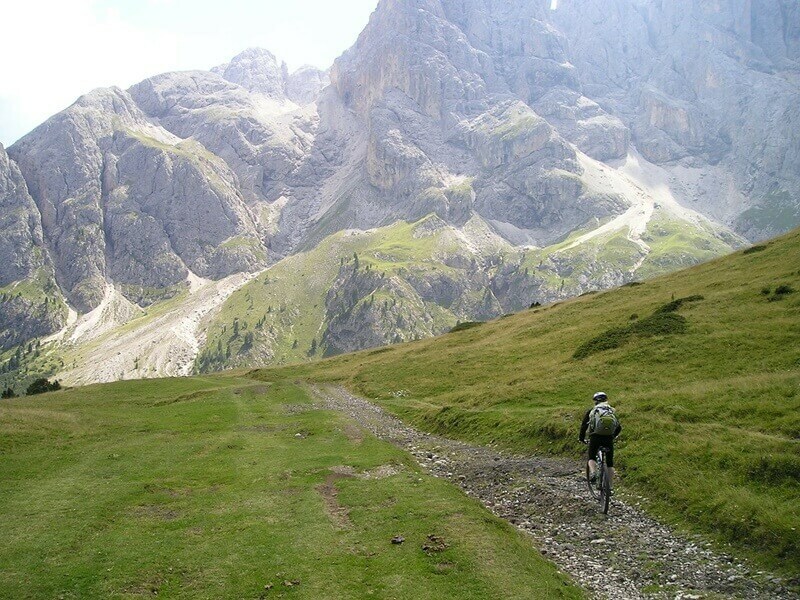 The mountain biking trail network in Val Gardena around the Sella mountain massif boasts spectacular views of the Dolomites. 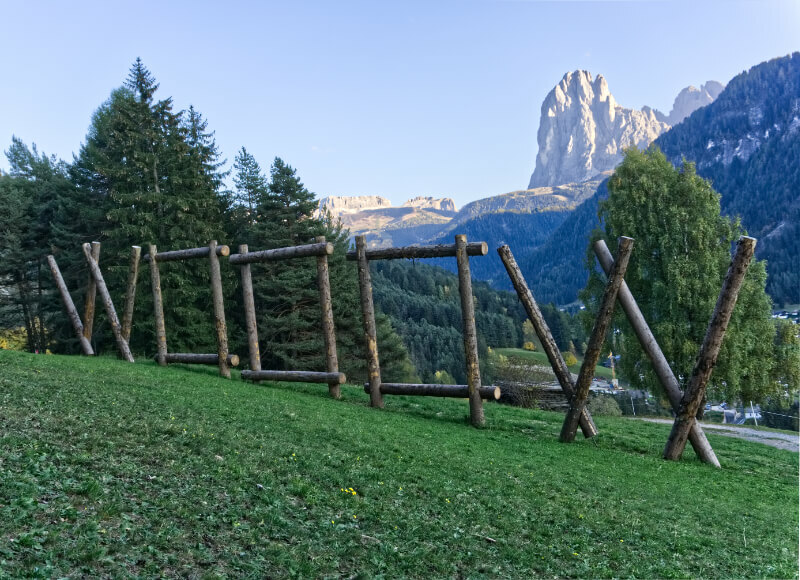 A hiking outing every mountain lover must embark on is along South Tyrol’s ancient irrigation canals called Waalwegs. Carved into mountainsides, these ancient pathways ascend easily and wind through miles of meadows, forests, vineyards and orchards. With each step, you’ll bounce along to the soothing song of running Alpine water. 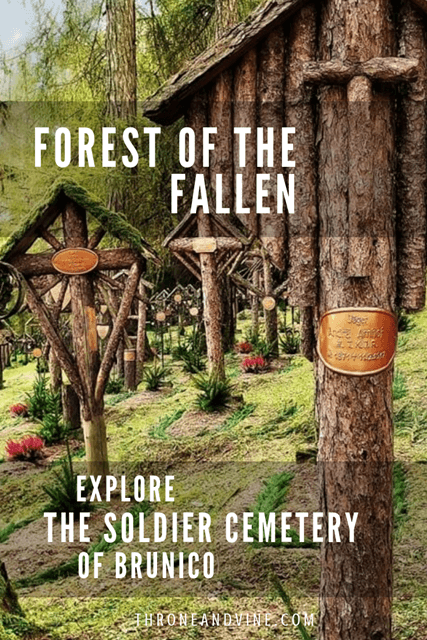 And you’ll encounter everything from castles to churches to the curious calls of cuckoo birds and the comforting clangs of cowbells. 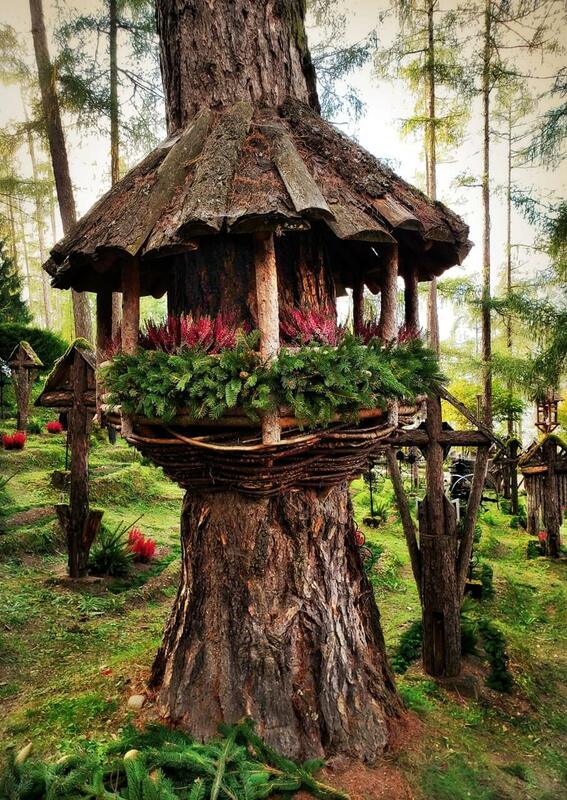 Around 5,000 traditional Alpine farms still adorn South Tyrol’s slopes. 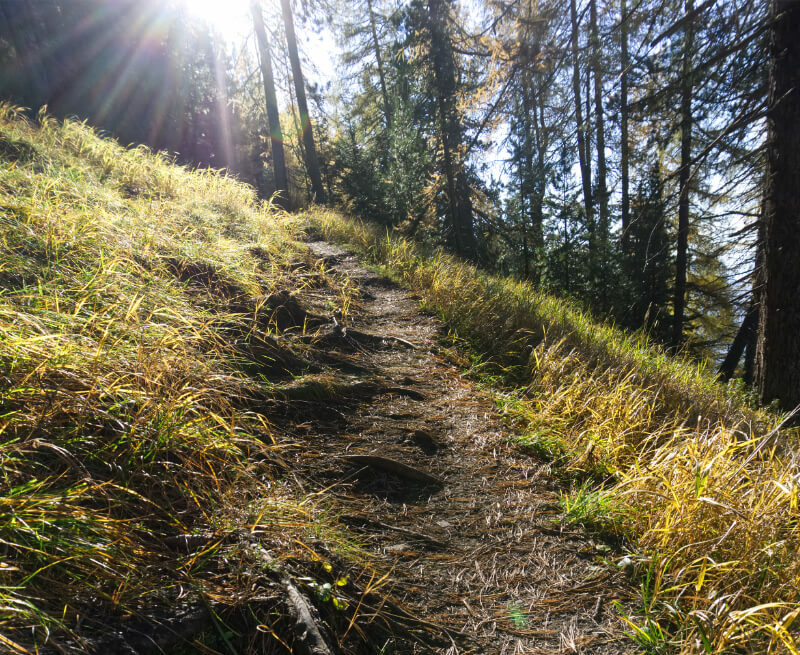 Waalweg trails gently ascend slopes to bring you face-to-face with South Tyrol’s stunning mountain scenery. Thanks to South Tyrol’s state-of-the-art lift systems, outdoor adventure in its mountains is available to every age and experience level. On every outing, we meet travelers in their 70s and 80s vigorously enjoying the hiking trails. Alpine air enlivens the adventurous spirit no matter your age. Beyond thrills and breathtaking views, the mountains of South Tyrol offer incredible cultural excursions. 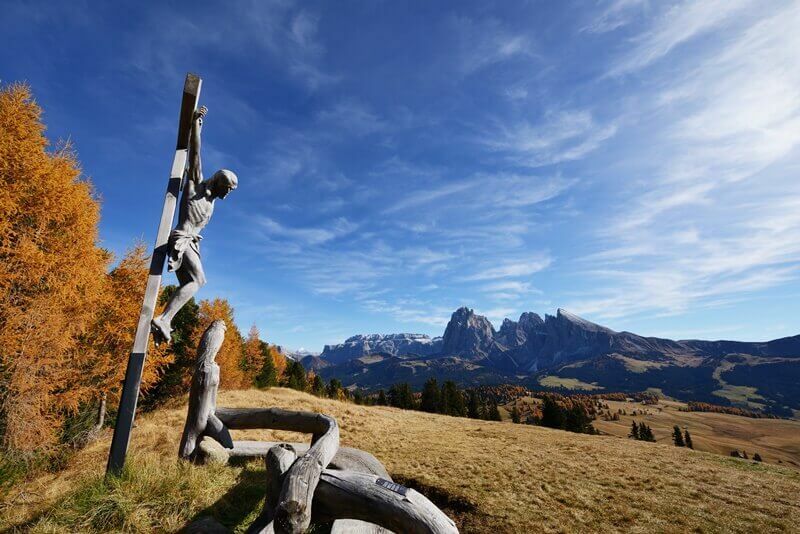 You can witness the traditional woodcarving craftsmanship of Val Gardena and walk among age-old legends such as the Witches’ Benches by Schlern Mountain. With 80 percent of South Tyrol mantled by undulating mountains that roar and whisper all at once, it’s no surprise the region is a celebrated spa and wellness destination. The natural splendor alone is enough to elevate your wellbeing. But South Tyrol offers you much more. Nestled amidst the summits are wellness resorts where you can experience the curative powers of pure Alpine air, mineral-rich water, fresh herbs, and sun-kissed scenery in truly novel ways. Preidlhof Hotel & Spa immerses you in a Mediterranean wonderland to rejuvenate mind, body and soul. These resorts masterfully harness their natural surroundings fusing contemporary design ingeniously with rustic charm. The deep feeling of relaxation we’ve enjoyed at South Tyrol’s wellness resorts has imbued a restorative calm to our daily lives. They can do the same for you. Whether it’s reaping the health benefits of ancient and modern treatments or simply letting worries wash away while floating effortlessly in a salt-water infinity-pool, you will come to relish how the wellness resorts in South Tyrol detoxify the body and pacify the mind. Discover more about the invigorating blessings Alpine wellness gives you by reading our reviews of Preidlhof Hotel & Spa and Hotel Quelle Nature Spa Resort. Both of these resorts have won multiple wellness awards. They are distinctly different in ambiance and character, but equally splendid. Over thousands of years, South Tyrol culturally bridged northern and southern Europe. 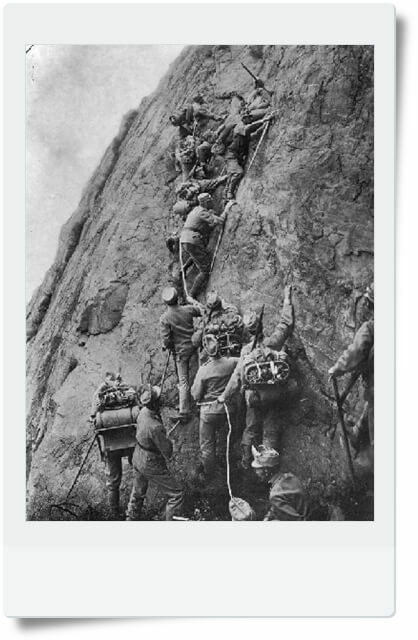 Deep history continues to echo across its mountainsides and valleys. In fact, the Alps’ smallest city, Glurns, sits like a medieval pearl in South Tyrol. Practically preserving the town in the 16th century, a wall with fortified towers forever keeps its historic charm intact. 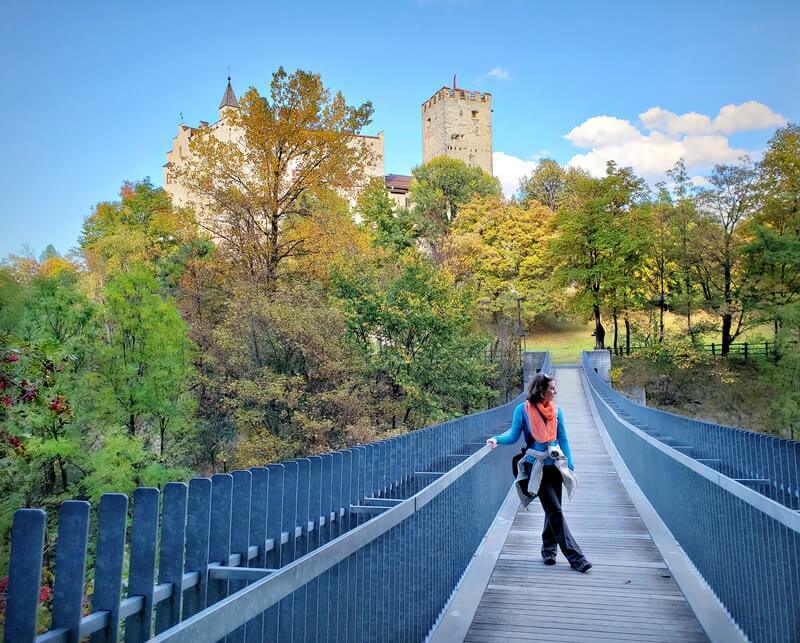 But for this post, we focus on the medieval sight that impresses the most in South Tyrol: castles. Few things capture the imagination like an imposing fortress towering from an even more imposing mountainside. South Tyrol has no shortage of them. The region swells with 800 castles, ruins and fortresses — more than any other area of Europe. If dragons ever flew surely it was over South Tyrol. Castle Taufers in South Tyrol attracts 75,000+ visitors each year. South Tyrol’s ancient strongholds provide a jaw-dropping way to plunge yourself into the Middle Ages. Hiking trails wind through a myriad of landscapes to many of its castles. Enjoying them from up close or from afar presents endless photo opportunities. It can be tempting to walk with your eye to the lens. Don’t do that. Touring South Tyrol’s castles always leave us awestruck. A walk through age-old halls where kings, queens and knights once roamed unveils a spellbinding glimpse into the heart of medieval Europe. While many castle sights are enchanting, some are haunting. The dark, dank cavernous prisons and torture chambers you can witness impart a new appreciation for modern life. One of our favorite mountain haunts is Castle Tirol. Perhaps the most historically-significant castle in South Tyrol, Castle Tirol stands on a rocky spur in the village of Dorf Tirol. It was once the ruling seat of the Counts of Tyrol whose iron-throned influence gave the entire region its name. A formidable fortress in its day, the castle sees all with the Etschtal and Val Venosta valleys sprawled out far below its walls. Sacking it would have been next to impossible. 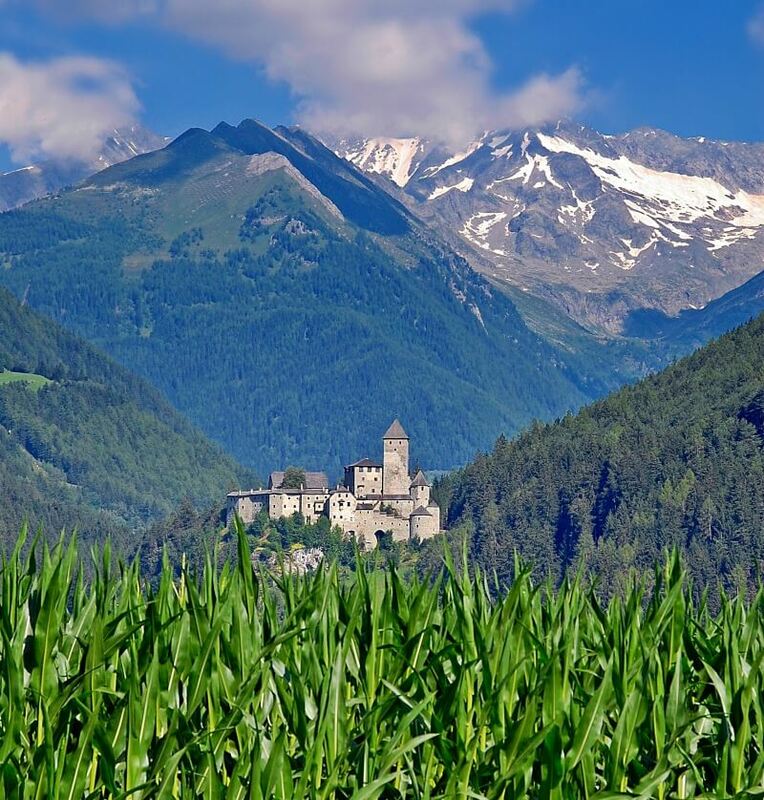 Castle Tirol is one of 800 medieval castles riddled across South Tyrol. The Brunnenburg Castle looms over the vineyard shrouded village of Algund. It stands below Castle Tirol forming a brotherhood of strongholds to visit right after the other. 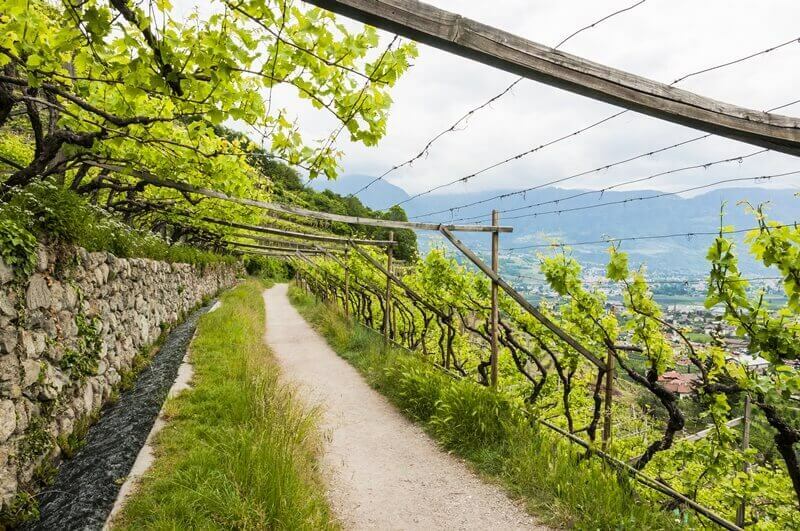 After visiting Castle Tirol, we like to sip on a refreshment at Biergarten am Schlossweg — a beer garden perched under a grape canopy offering castle views through the vines. On our last visit here, we devoured a savory plate of South Tyrolean bacon dumplings officially called Speckknödel. If a castle walk doesn’t whisk you back to medieval times, this hearty dish will. It dates back to at least the 13th century. 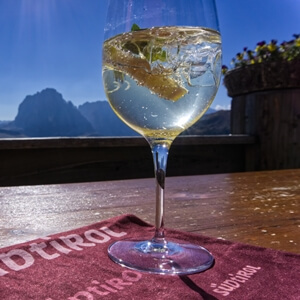 Continue reading to discover more delicious indulgences of South Tyrol. Foodies will uncover plenty to savor in South Tyrol. It is Italy after all. But then again it is so much more. The region is considered Italy’s culinary star — boasting more Michelin-starred restaurants in one place than anywhere else in the country. Quality reigns supreme at the table in South Tyrol. It was the first region in Europe to establish a trademark for regional food. This emphasis on absolute quality has not gone unnoticed by the top-rated chef in the world, Massimo Bottura. He visits South Tyrol frequently to dine. Thanks to the eclectic mix of northern and southern European cultures, each bite in South Tyrol can launch you on a distinctive journey. Firmly rooted farm-to-table traditions tantalize the taste buds with a fusion of Italian, Tyrolean, German and mountain-grown flavors. But if you’re only longing for generous helpings of traditional Italian, you don’t need to venture further south. 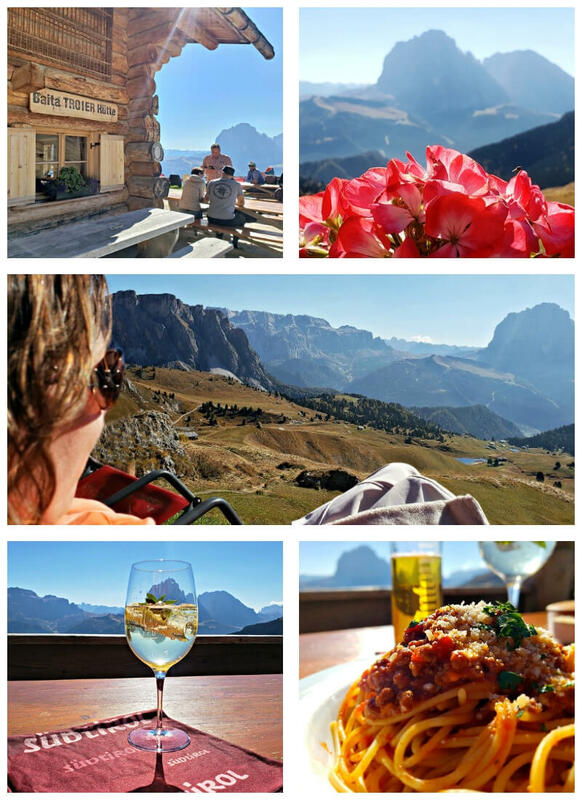 We’ve enjoyed some of the finest authentic pasta and pizza dishes in South Tyrol. That said, we think a visit to South Tyrol is not complete without dining on the region’s specialties. Culinary delights like smoked speck, knödel, apple strudel, white asparagus, krapfen and South Tyrolean cheeses and breads just to name a few are must-have delectable treasures. The rustic restaurants, taverns and cafes will encourage you to slow down, take a seat and chat with a local or two. There's no better way to get a feel for South Tyrolean culture. 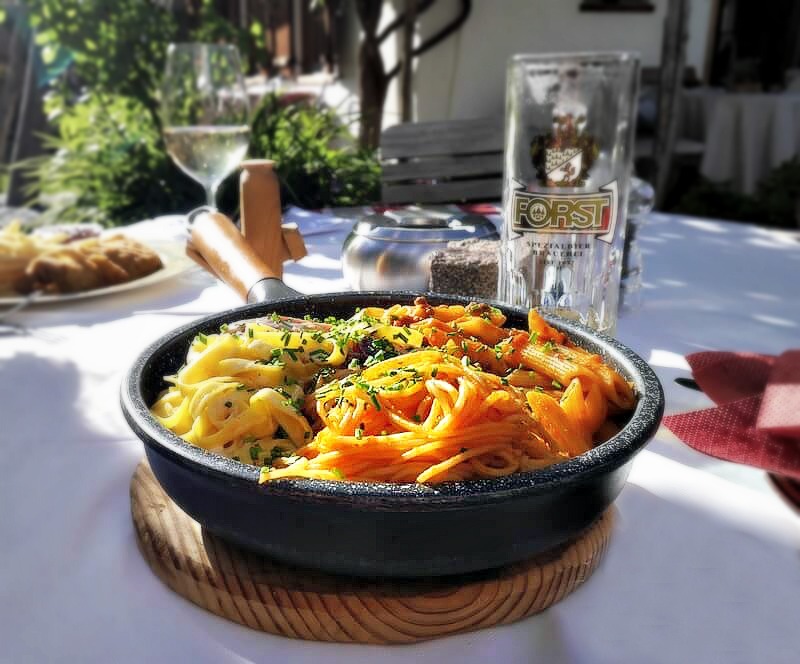 One of the best ways to immerse yourself in the authentic cuisine and culture of South Tyrol is to dine at member restaurants of the “Sudtiroler Gasthaus” group. This association of gastronomic establishments brings to life South Tyrol’s traditional down-to-earth hospitality and ambiance paired with the best local ingredients. 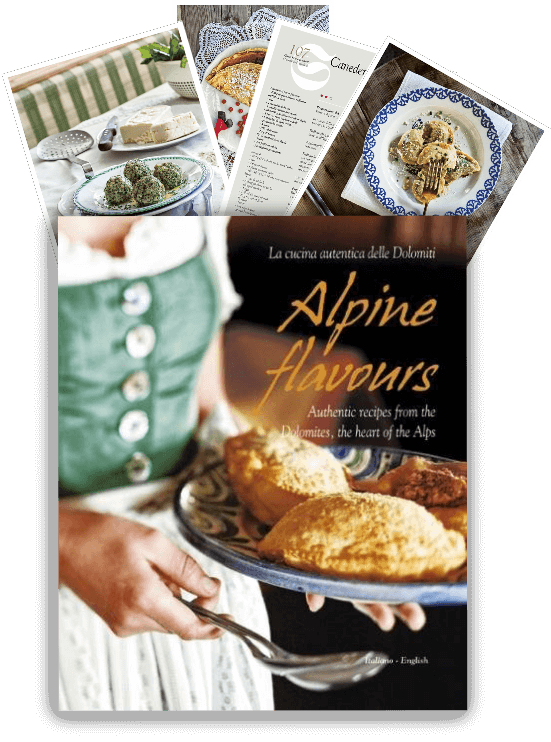 The aim is to preserve the authentic culture and quality that sets South Tyrol apart. An independent panel of judges makes sure member restaurants adhere to strict quality control standards promised by the Südtiroler Gasthaus brand. Spinatknödel or spinach dumplings. A delicious South Tyrolean classic for lunch or dinner. Beyond flavorful dishes available morning, noon and night, the dining settings in South Tyrol are as picturesque as a fairy tale. Under the watchful eye of many South Tyrolean castles, lie quaint villages seemingly lost in time. These precious jewels spring up from fertile valleys and hillsides nearly as much as the area’s vineyards and orchards. Each one provides its own medieval charm to get lost in farm-to-table pleasures. For us, villages in South Tyrol strike the perfect balance between adventure and relaxation. Strolling crooked cobblestone streets unspoiled by the grip of modern life is a welcome reprieve from rigorous hiking. The rustic restaurants, taverns and cafes will encourage you to slow down, take a seat and chat with a local or two. There’s no better way to get a feel for South Tyrolean culture. Mountainside taverns like the Dorfstub’m in Schenna offer home-style meals made with only local ingredients. If sleepy mountain villages are not your speed, South Tyrol’s capital, Bolzano, offers plenty of vibrancy with lively streets, open-air food markets, bistros, pubs and shops all wrapped in old world beauty. The dining scene in Bolzano teems with a rich culinary heritage. Some of the region’s most renowned chefs work in the kitchens of Bolzano. Even Hollywood celebrities have taken note. South Tyrol chefs like Manuel Astuto, head chef at the Parkhotel Laurin, have been flown around the world to cook at private affairs. Even without eating, the city itself is a treat worth consuming. It revels in centuries of influences and offers a history rivaling Rome with the South Tyrol Museum of Archaeology. 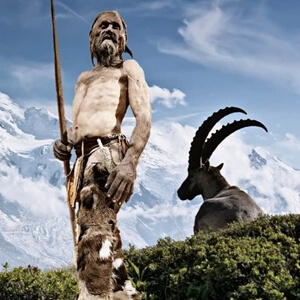 Within lies Ötzi the Iceman — an ancient warrior on display whose corpse was remarkably preserved in a South Tyrol glacier for more than 5,000 years. Read our post about visiting Bolzano to learn more about what there is to see and do in South Tyrol’s most cosmopolitan city. Since we touched on South Tyrol’s renowned cuisine, it’s only natural we tell you about its wines next. The wine gods have been blessedly kind to South Tyrol. But that hasn’t come without a lot of work. 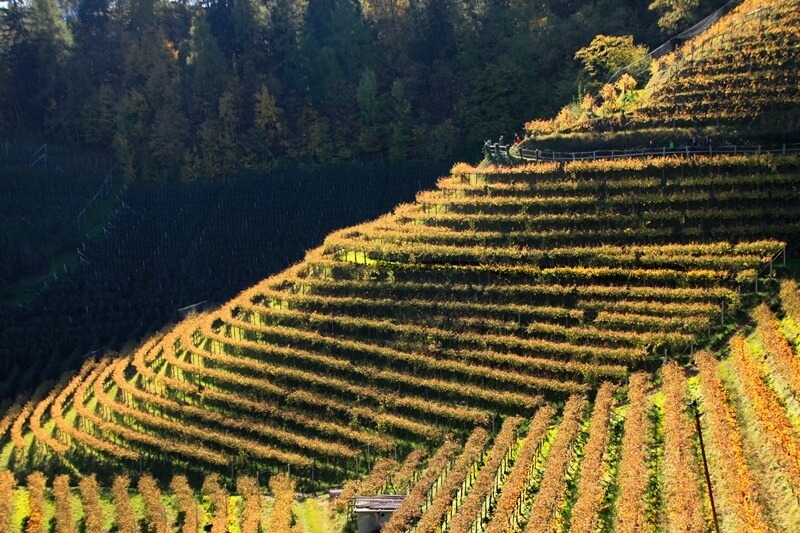 Over the last 3,000 years, South Tyrol’s wine artisans perfected techniques to grow and tend to vines on steep slopes. The result? Scenery that is a living, breathing masterpiece. High elevation vineyards flow down sun-kissed mountainsides producing some of the highest regarded wines in the world. 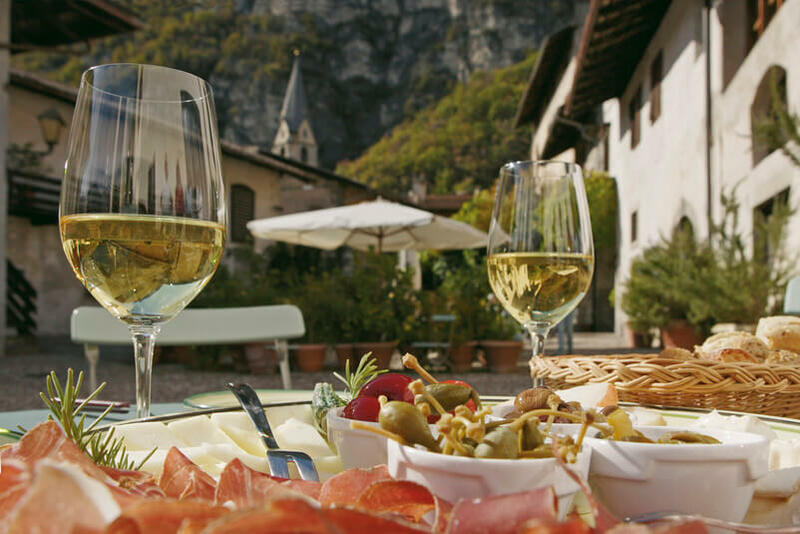 Local cold cuts and Mediterranean delicacies are a perfect companion with South Tyrol’s Alpine wines. Crisp, mineral-dominate whites such as Gewürztraminer, Sauvignon Blanc and Pinto Grigio are among the region’s most popular wines, but you’ll also discover heavenly reds such as Lagrein and Pinot Noir. In fact, Italy’s top three rated Pinot Noir wines come from Alto Adige (South Tyrol wine estates use the Italian name for the region on their wine labels). The best way to get to know South Tyrol’s wines is by visiting its winemakers. Many of the region’s 150+ producers have tasting rooms in their cantinas allowing you to sip among some of the most enthralling architecture in the Alps. From modern, forward-looking structures to stately manors rooted in the past, these wineries impress from within the glass and without. South Tyrol wineries, like Tramin pictured here, possess stylish architecture as stunning as the scenery they enjoy. Italy’s oldest wine road, the South Tyrolean Wine Road, leads you through 16 wine villages set along slopes draped with vines and valleys blanketed in apple orchards. South Tyrol is, in fact, Europe’s apple basket — more apples come from its fertile orchards than any other region. Every time we take the wine road the lovely sips and sights we encounter end up consuming our day. If you’re a biking enthusiast, consider pedaling and sipping your way from wine village to wine village. With more than 300 days of sunshine each year, you won’t consider the ride just scenic, but heart-pounding spectacular. In 2009, the Roma Wine Festival declared the South Tyrolean Wine Road the most beautiful of Italy’s 140 wine routes thanks to its perfect interplay of wine, scenery and culture. 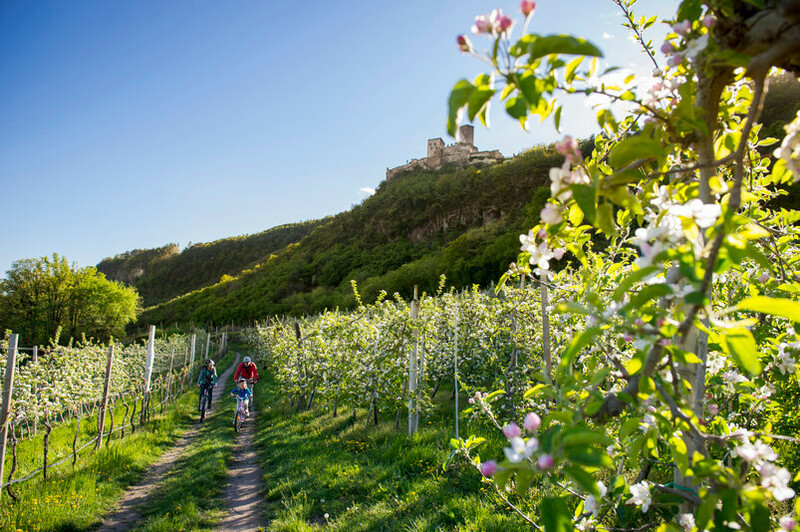 Biking in the middle of vineyards and orchards while under the shadow of a castle? Only in South Tyrol. If wine isn’t your beverage of choice when dining or unwinding, do not fret. South Tyrol has a craft brewing tradition that goes back more than 1,000 years. Alpine water fresh from mountain springs serves as the foundation for producing beers with distinct character and flavor. The perfect frosty partner to any meal or thirst-induced adventure. A popular brewery we like to visit is Forst in Algund. Set in the shadow of a lush mountainside, Forst offers a variety of high-quality beers. You can kick back and sample them in the brewery’s restaurant or beer garden. Enjoying a cold beer above the ancient village of Lajen. While Forst is the largest local brewer, you can also visit microbreweries such as Pfefferlechnerkeller (yes, that is the real name) in Lana or Gassl Bräu in Chiusa. Both produce remarkably tasty craft beers and offer a full menu of well-paired South Tyrolean dishes. The only structures sprouting from the South Tyrolean countryside more than castles are churches, chapels, monasteries and shrines. 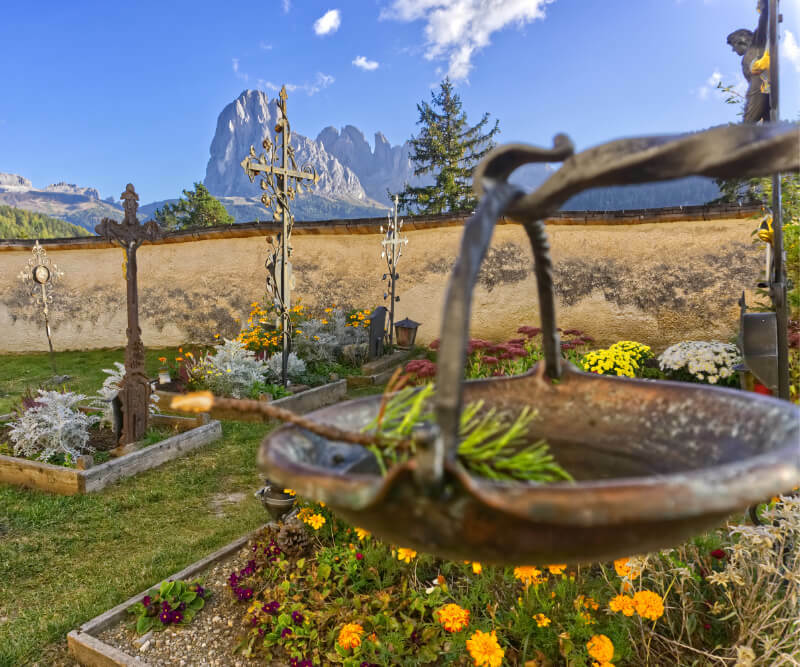 South Tyrol possesses an astonishing number of fascinating historic religious sites to explore and photograph. Faith here is celebrated in immensely grand ways as well as with the most subtle expressions. 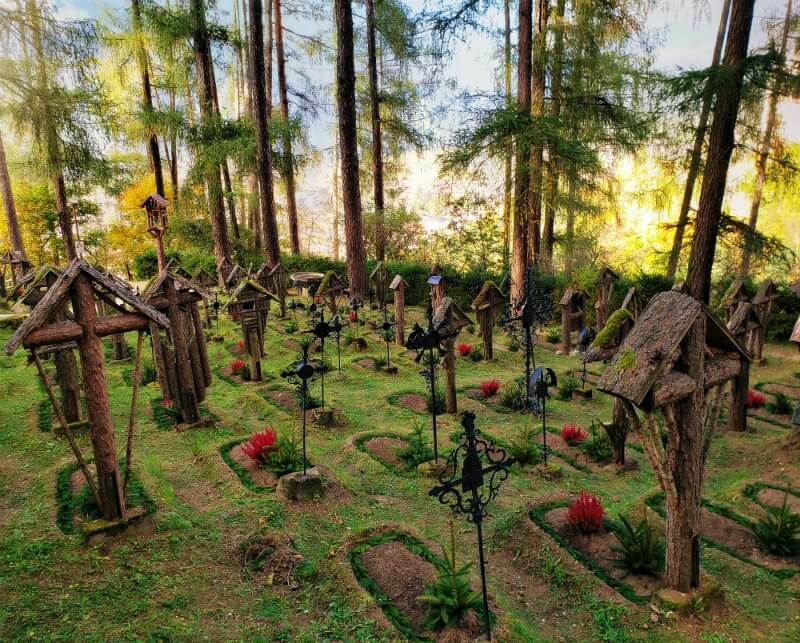 South Tyrol's wayside shrines seem to welcome you out of nowhere — gracefully watching over all those who wander by. 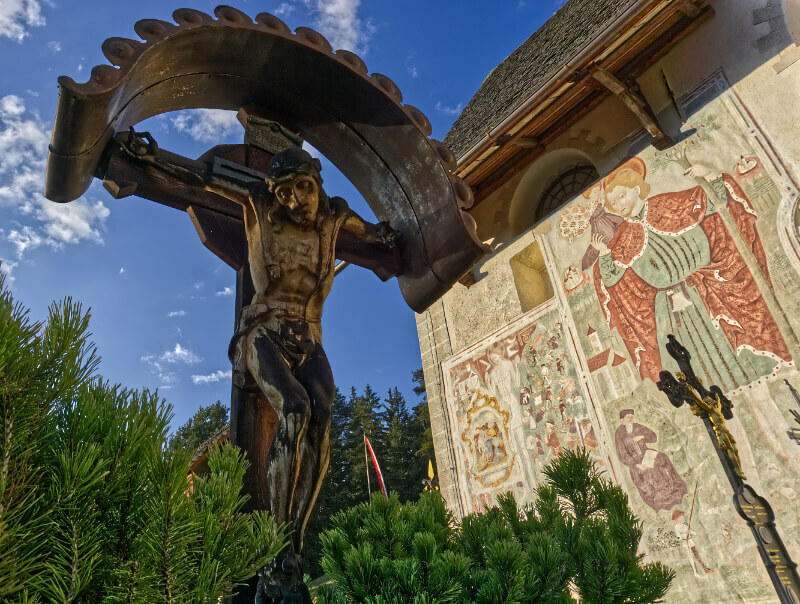 Taking the time to discover and admire the unique architectural, artistic and historic importance of religion to South Tyrol through the centuries is one of the more rewarding activities we’ve enjoyed on our visits. The achievements of the artists, architects and masons from long ago amidst the lofty crags of South Tyrol’s mountains is nothing short of spectacular. 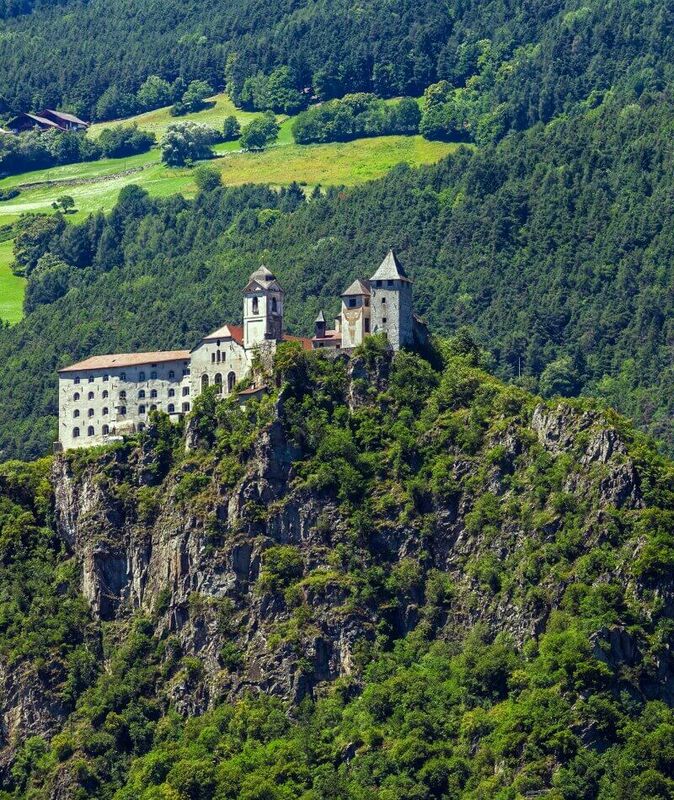 On top of South Tyrol’s “Holy Mountain” lies the Sabiona Monastery. 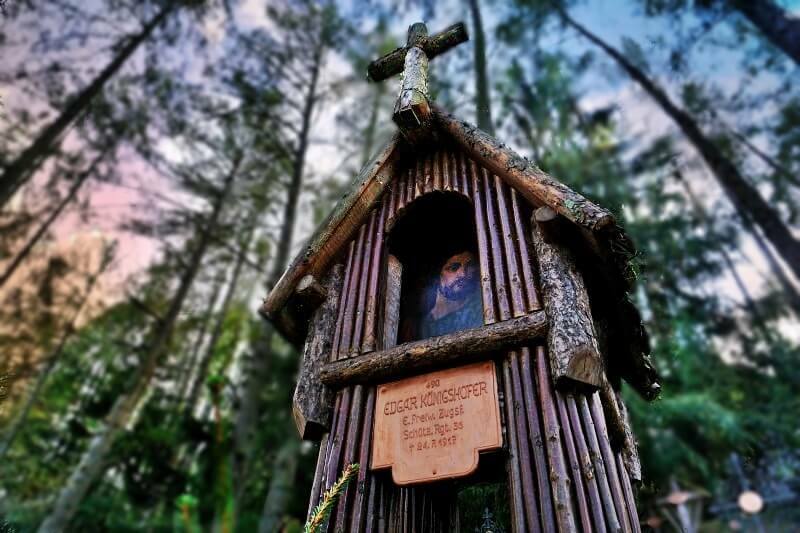 It can be reached by hiking up a trail from the village of Chiusa. From sky-piercing spires to interiors flourishing with centuries-old frescoes and intricately crafted wood carvings, the beauty offered by South Tyrol’s largest cathedrals and its smallest chapels always instills a sense of wonder. Walking through them reveals remarkable attention to detail that never fails to mesmerize. A historic treasure we recommend all to see is the Abbey of Novacella (also known as Neustift Monastery) near the edge of Brixen. This monastery astounds with architectural styles spanning centuries. The Baroque interior of its church will leave you breathless. But perhaps the best part of visiting Novacella is that after studying all its glory you can sip its delightful wines. It is one of the oldest wineries in the world. 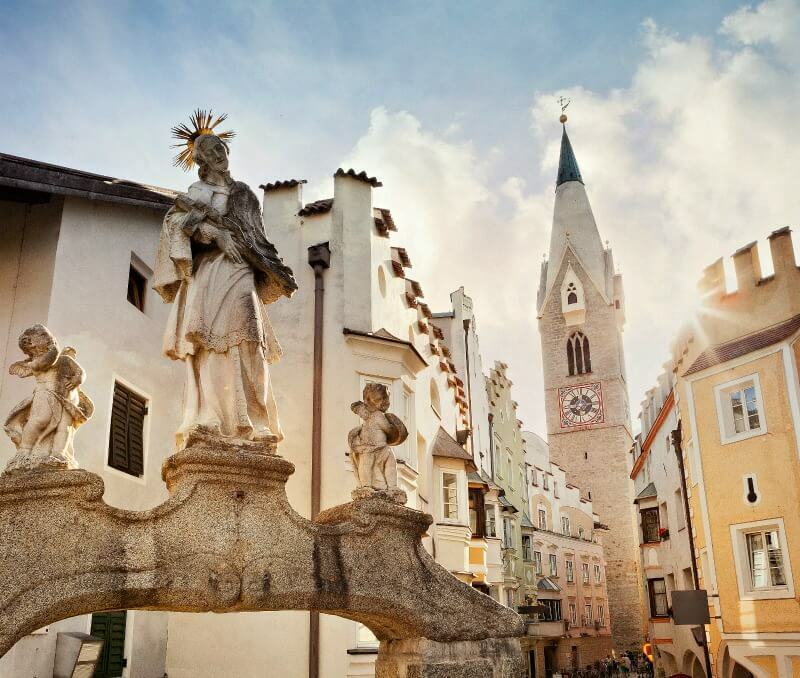 The oldest town in South Tyrol, Brixen, enjoys some of the most important religious structures and works of art in northern Italy. 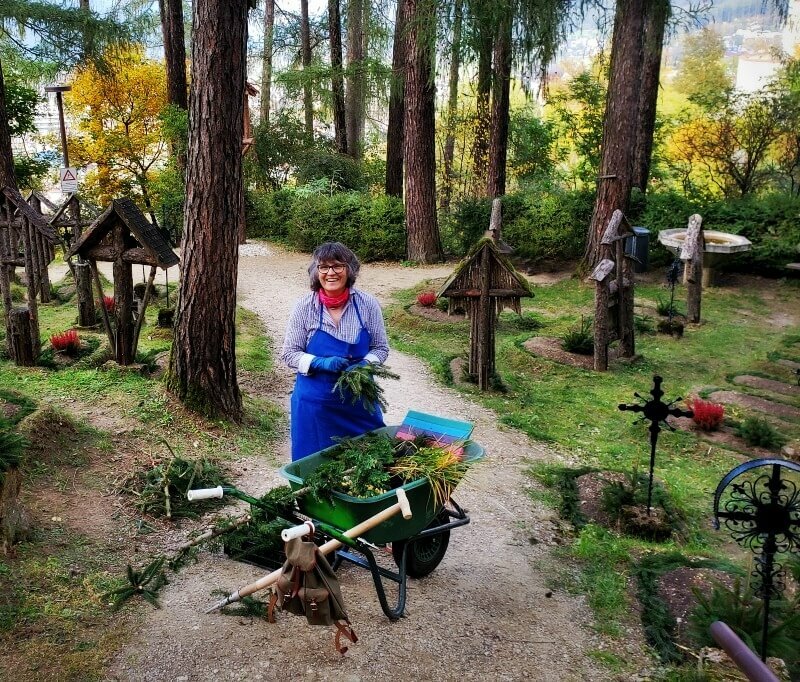 One of the qualities we find most endearing about South Tyrol is how for more than a thousand years the people of this area took care to harmonize spirituality with the natural surroundings. 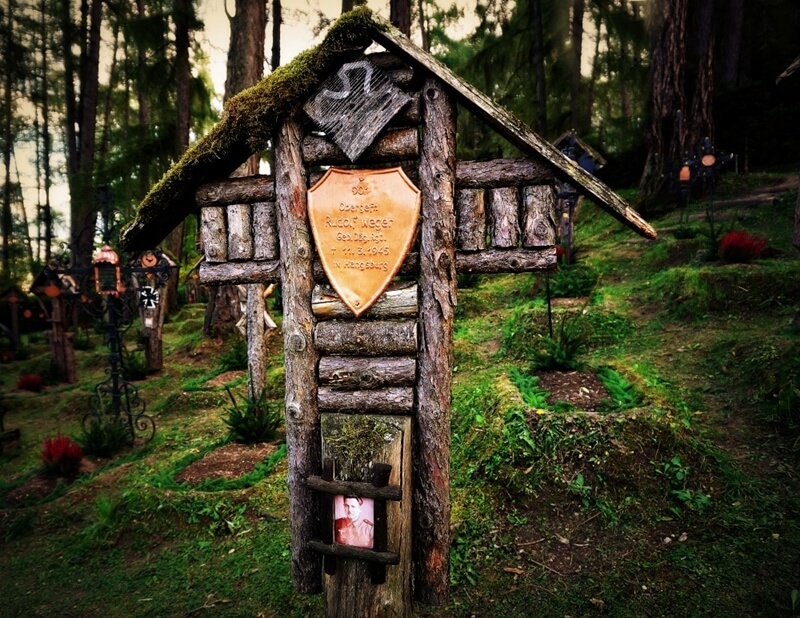 Wayside shrines have a rich history in South Tyrol. 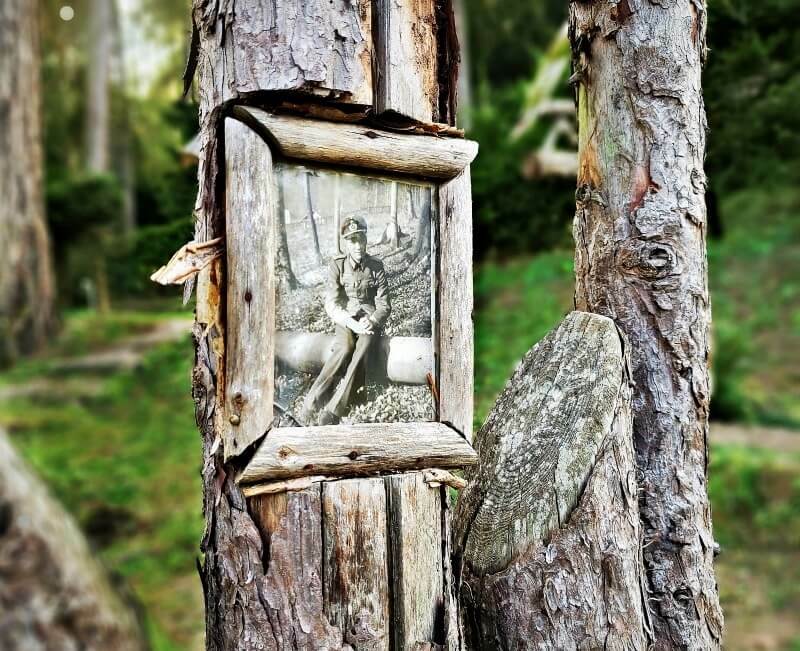 These tender creations abundantly appear along hiking paths with many also elegantly nestled in nooks throughout village neighborhoods. On our treks, we’ve always found them an inviting surprise. They seem to welcome you out of nowhere — gracefully watching over all those who wander by. 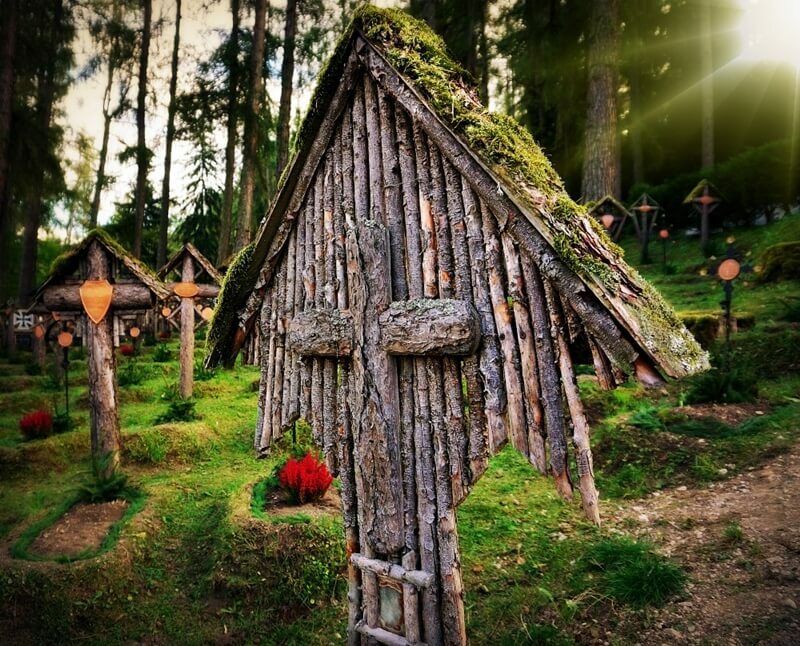 A striking Alpine shrine captured while hiking the Dolomites in South Tyrol’s Val Gardena. A place for weary travelers to rest and pray, even the oldest shrines are still carefully attended to by local residents. The wide array of sizes, shapes and materials used to construct shrines touchingly showcases the talents and devotion of the community. 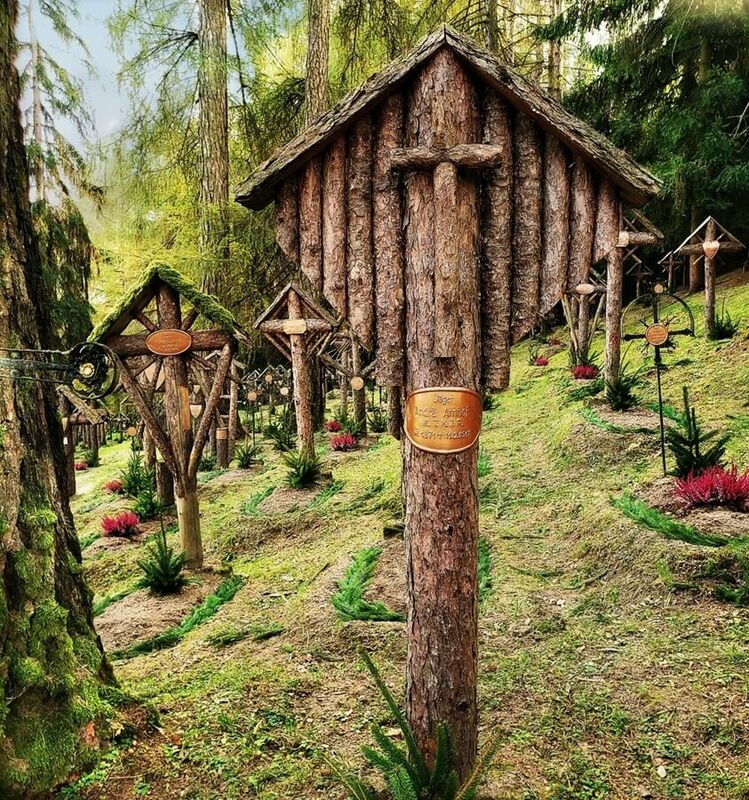 Many of these religious markers hold candles, rosaries, photographs and thoughtfully-crafted carvings. Quite often native flowers encircle a shrine intimately blending them in with the natural beauty of the landscape. No matter the season you choose to visit, your time in South Tyrol will create fiercely enduring memories. The kind that will call you back. The busiest season is summer as tourists mainly from Germany, Italy and the U.K. arrive in large numbers. But winter is also plenty popular for the snow-bound adventurer. South Tyrol boasts 30 ski resorts with 695 miles of ski trails crisscrossing the land. While summer in South Tyrol is spectacular, we think the best time to visit is the spring and fall. Specifically, late May and early June or September through October. You’ll have much more of the Alpine-Mediterranean wonderland to yourself. And you’ll still have nearly every opportunity to enjoy the great outdoors on foot or bike. Plus, you’ll save money on your trip as prices tend to come down. Just be prepared for a bit more unpredictable weather if you’re venturing into the higher altitudes. Spring and late fall can still bring snowfall to the mountain peaks. 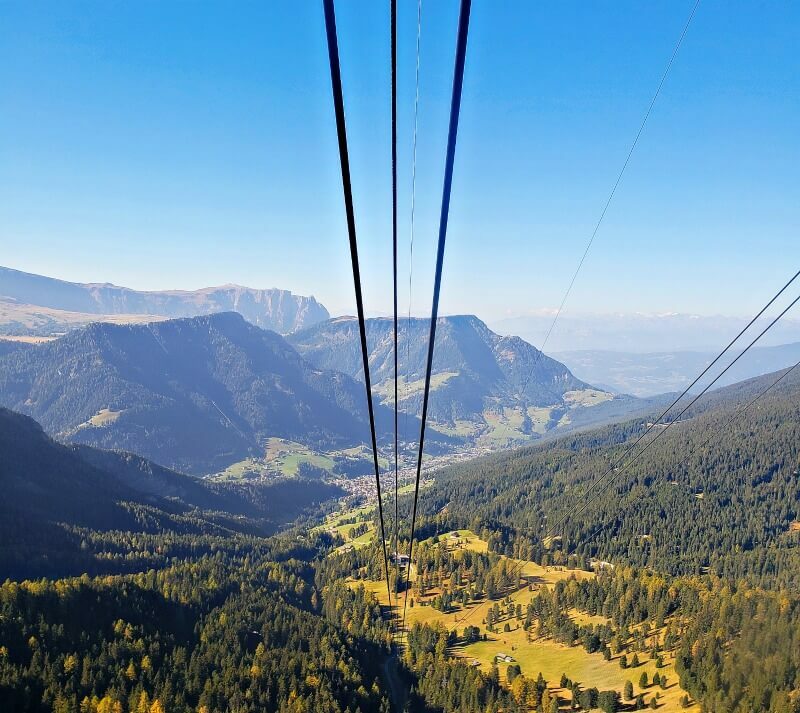 You’ll also want to know the lift system operating dates if spending the bulk of your time in the Dolomites or plan to do high-altitude hikes elsewhere. Autumn sets South Tyrol ablaze with colors. 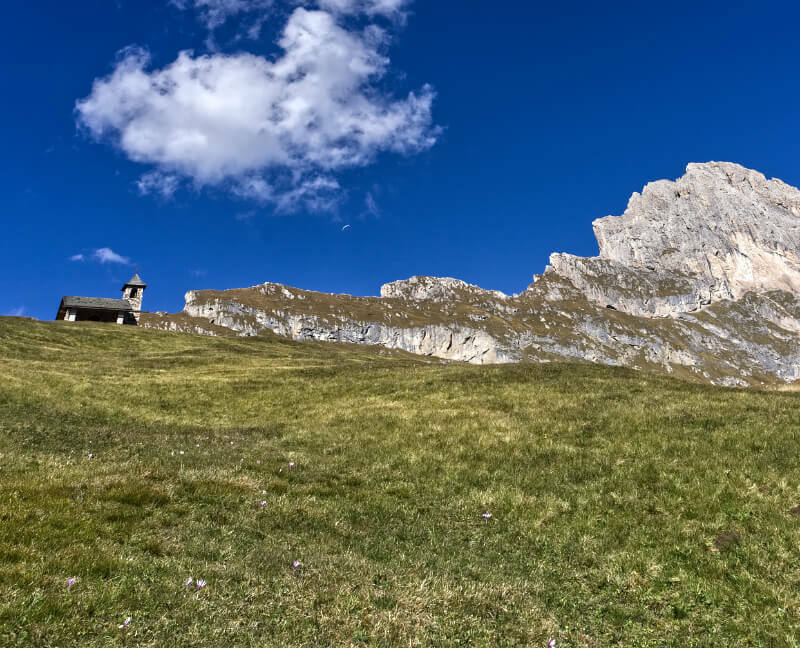 Here, the small St. Johann Church basks peacefully under the Geisler peaks of the Dolomites. Wine lovers may find autumn most appealing as a number of festivals take place celebrating the season’s harvest. You’ll also be able to roam through vineyards and orchards flush with autumn colors not to mention ever enticing aromas. It’s an experience unlike any other. If you visit during December you can treat yourself to a postcard-perfect setting for the holidays. Traditional Christmas markets (Christkindlmarkt) abound this time of year, allowing you to discover an abundance of handmade creations that will take your holiday decorating to a whole new level. Getting to South Tyrol is relatively easy even though the region does not have a major international airport. The closest major airport is located in Innsbruck, Austria an hour north of South Tyrol. Nearby major cities where we’ve found the best airfare deals include Munich, Milan and Venice. From each of these cities, it takes under 3 hours to reach South Tyrol. Other major cities nearby include Salzburg (2.5 hours), Zurich (4 hours) and Verona (1.5 hours). After landing you can make the trip to South Tyrol by car, train or shuttle bus. Regardless of your starting point, the journey is pleasant and scenic. We recommend renting a car. The freedom to hop around South Tyrol at your own pace is ideal. It’s worth noting that parking in South Tyrol and navigating its roads and highways is fairly straightforward. And with today’s modern GPS units you can get step-by-step voice directions to take you anywhere without any hassle. If you’re planning to rent a car be sure to check out our article on driving in Italy. It is full of helpful tips that will make sure you’re ready for stress-free driving in Italy. If you prefer to use public transportation while in South Tyrol, you can pick up a Mobilcard at your hotel, transportation hubs or tourist offices. This affordable card provides quick access to South Tyrol’s stellar public bus and rail networks for 1, 3 or 7 consecutive days. The abundance of culture, activities and sights in South Tyrol runs as high as its summits. One could never cover it in a single blog post or even a lifetime of blogs posts. However, it’s our hope as you explore Italy vacation ideas that you stamp South Tyrol on your travel wish list…preferably at the top. A hidden treasure of wows awaits you. Our resources are based on personal experience and are designed to save you time and money to ensure a vacation of a lifetime in South Tyrol. 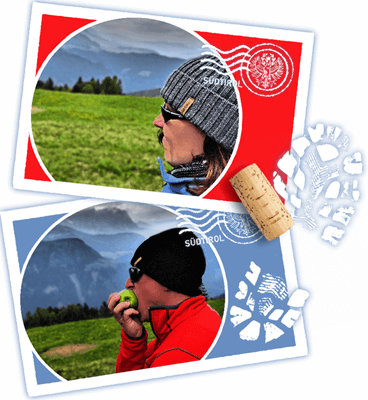 To discover more about South Tyrol and our adventures, be to subscribe to our email updates. We live and breathe South Tyrol and you’ll find it shows in the stories we tell. 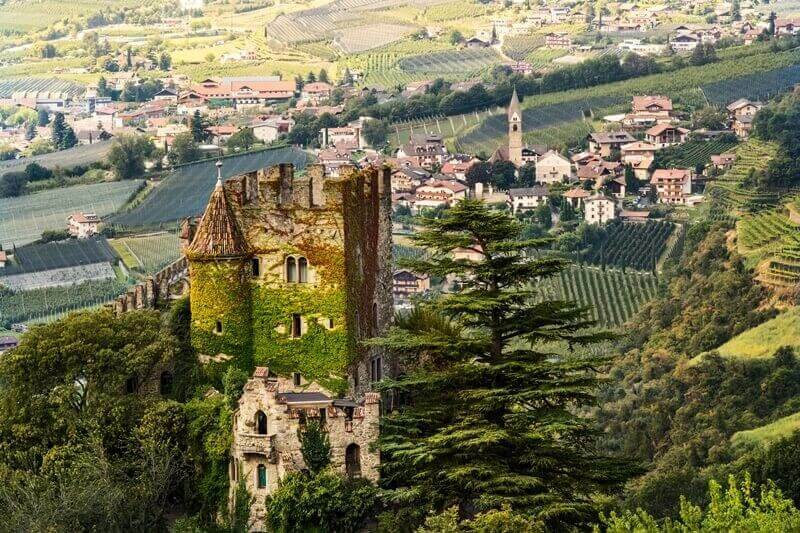 Through Throne & Vine, you’ll fall in love with the region and find the resources necessary to plan an unforgettable trip to Italy’s best-kept secret. We look forward to seeing you on the trails and poolside! 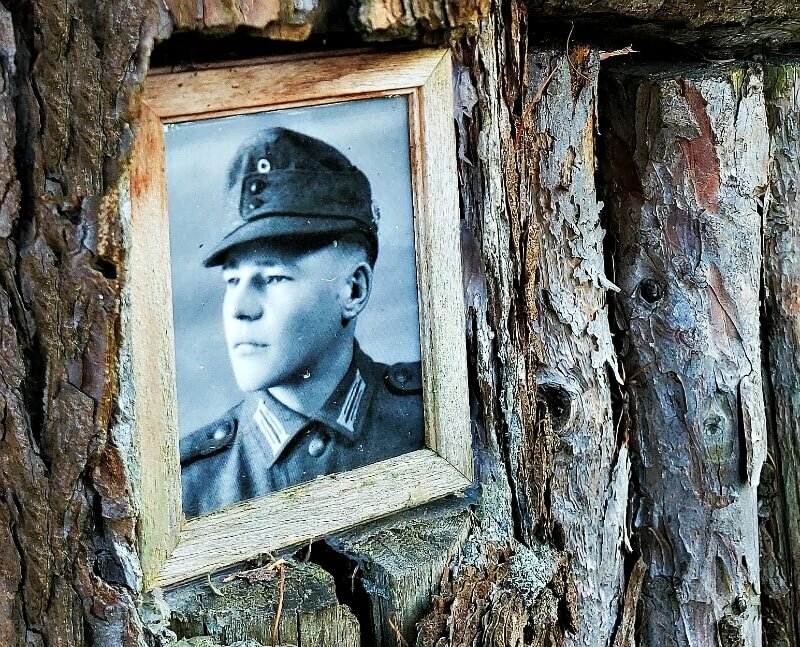 If you have a South Tyrolean adventure or tip you would like to share, please comment below. We’d love to hear from you! TAP TO SAVE & FOLLOW US ON INSTAGRAM TO SEE MORE OF SOUTH TYROL!